Brittany Bradford, Media Relations Assistant for the Philadelphia Film Society, recently sent an e-mail to local universities plugging the nonprofit’s ongoing (and strangely punctuated) filmadelphiaCLASSICS series (a name shared with Irv Slifkin’s Filmadelphia book as well as the PFS’ web address [Slifkin’s book was published back in 2006 when the PFS’ web address was phillyfests.org or .com, I forget which]) that features a monthly screening of a locally-shot mainstream film held in a suitably related venue. 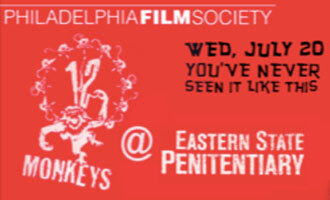 In the e-mail regarding their upcoming 12 Monkeys screening at Eastern State Penitentiary, the PFS claim that: “As only the second film screening at ESP, this is a rare opportunity to see a film at the city’s most haunting venue.” A quick Google search reveals that Jay Schwartz and his Secret Cinema have alone held 11 screenings at the prison over the years, many of which were quite beloved judging from online reactions and write-ups. And while the above quote isn’t stated on the PFS’ website, it is unfortunate that the college students of our city are directly being fed misinformation, especially when this misinformation is related to the ongoing battle between public film vs. video screenings (and we all know who’s winning that…). You may be thinking, “at the end of the day, who really cares about things like this?” Cinedelphia does. And you know where we stand. NOTE: Cinedelphia has supported the PFS and their Philadelphia Film Festival for many years, we are also well aware of the fact that their digital projector is currently on loan to the International House while the venue raises funds for a new one of their own, a noble and respectable gesture on the nonprofit’s part. And I know, Cinedelphia readers would rather watch Brute Force than 12 Monkeys any day, but at least they’re providing something to do with a bit of creativity involved. If they get their facts straight then it’ll all be good. UPDATE: Brittany Bradford has since sent Jay Schwartz an apology via e-mail.